The New Hampshire Avalanche is two-for-two, winning two titles in its first two seasons in the Eastern Hockey League. The Avalanche captured their second title this past Saturday with a 4-3 win in the championship game against the Philadelphia Little Flyers. “We just had such an awesome group again this season,” Avalanche head coach and general manager Chris Cerrella told the league website following the game. “There were a few points during the season where I wondered if this group could accomplish what last year’s team did, but that was all confirmed over the past couple weeks. Leo Avakovs scored with 12 seconds left in the second period for a 4-2 lead and the Avalanche held on, allowing only Mikey Giampapa’s goal in the third period. “Our group came together as a unit at the perfect time and, as a result, we are champions again,” Cerrella said. New Hampshire went 3-0 and Philadelphia went 2-1 in the round-robin portion of the EHL’s Frozen Four in Providence, Rhode Island. The Avalanche won the first meeting 3-2. New Hampshire’s Nathan Pickett, who was the Frozen Four Most Valuable Player, had his second shutout of the postseason in a 4-0 win over Wilkes-Barre/Scranton. Pickett made 23 saves in a 4-1 win over the Wizards. FRASER CUP: The North American 3 Hockey League Fraser Cup Championships are running March 27-31 at Seven Bridges Ice Arena in Woodbridge, Illinois. Six divisional playoff champions make up the tournament with a pair of three-team, round-robin pools. The top two teams in each pool will advance to the Saturday semifinals to determine Sunday’s finalists. Once the division playoff titles were determined, teams were seeded according to their regular-season point totals. The top-seeded Lewiston/Auburn Nordiques are in a pool with the Helena Bighorns and North Iowa Bulls. The No. 2 seed Binghamton Junior Senators and No. 3 seed Texas Brahmas are joined by the St. Louis Junior Blues. DIVISION FINALS: Elliot Plourde had a goal and three assists Saturday as Helena defeated the Great Falls Americans, 5-1, in the third and deciding game of the NA3HL Frontier Division finals. Four other teams – St. Louis, Binghamton, Texas and North Iowa – all completed two-game sweeps that day. 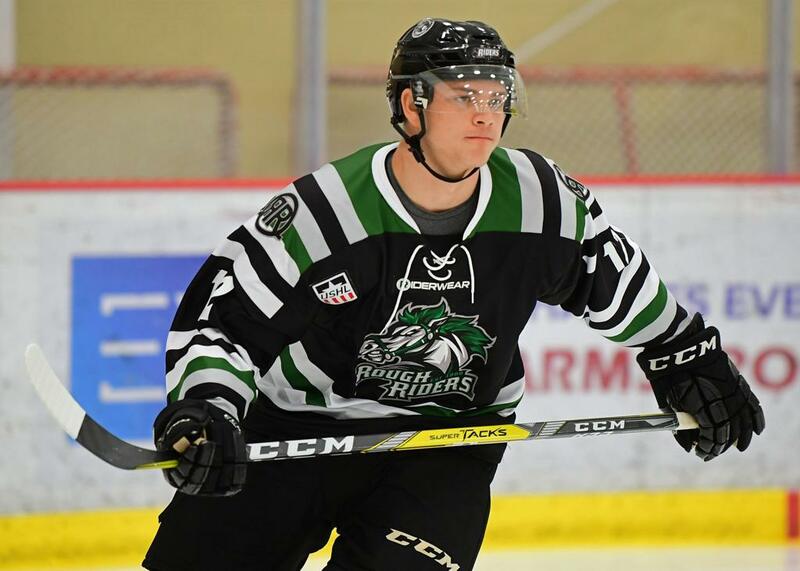 USHL ROUNDUP: Bobby Brink and Ben Kraws helped the Sioux City Musketeers win two of three United States Hockey League games to remain in the Western Conference playoff race. Brink earned USHL Forward of the Week honors for the third time this season with three goals and two assists in three games. Kraws stopped 47 of 50 shots while winning both his starts in goal. The Muskegon Lumberjacks, Chicago Steel, Youngstown Phantoms, Cedar Rapids Rough Riders and USA Hockey National Team Development Program have clinched playoff berths in the Eastern Conference. In the west, the Tri-City Storm, Waterloo Black Hawks and Sioux Falls Stampede have all clinched playoff spots. PLAYOFF BOUND: Brandon Perrone made 30 saves for his third shutout of the season and a 1-0 victory over the Jamestown Rebels, lifting the New Jersey Titans into the North American Hockey League playoffs. SCORING SPREE: Jackson Jutting had back-to-back, two-goal games scoring four of the five Minnesota goals as the Magicians swept a two-game NAHL series from the Janesville Jets. COLLEGE COMMITMENTS: Maiszon Balboa, a goalie for the NAHL’s Shreveport Mudbugs has committed to continue his career at the Air Force Academy. The 18-year-old from Colorado Springs, Colorado, is 10-8-2 with a 2.77 goals against average and .909 save percentage this season. Odessa Jackalopes captain Connor Fedorek is headed to Ferris State. The 19-year-old defenseman from Bethel Park, Pennsylvania, has eight goals and 24 assists in 55 games in his third NAHL season.